When I see or read one of these articles, I can’t help but think about how difficult this must make the process of job searching. Those sneaky tactics and strategies create the potential for negative recommendations and could tarnish your reputation with your current company. 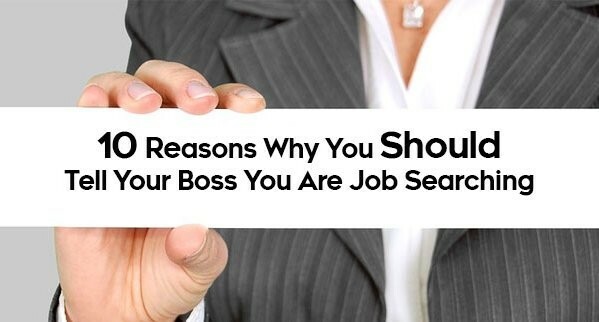 I’m not saying that any and everyone should announce to their entire team that they are job searching, but my clients and I have had much more success in this process by involving our peers and especially our supervisors. 1. You don’t have to sneak around and worry about them finding out. 2. They may be able to help you highlight some of your achievements. 3. They may be able to connect you with professionals in your desired next step. 4. They may even reach out to employers for you and act as a sponsor. 5. You may be allowed to flex your time to meet with employers or go to interviews. 6. They will appreciate the advanced noticed, so they can get a head start on recruiting and hiring for your replacement. 7. They might send you jobs that they see posted that fit your career goals. 8. They have plenty of time to prepare for reference checks and letters of recommendation. 9. They may be able to provide you with more relevant work tasks before your departure. 10. It’s always helpful to have support during a job search. I am well aware that not every job seeker out there has a great relationship with their supervisor, but you should have some colleagues who will support you. If you don’t, it is your responsibility to form those relationships. When you find that new job, focus on building a trusting, supportive relationship with your new boss. This list could easily be relevant to your relationship with a mentor in your organization or other peers you work with. It is also important to be aware of how your decision may impact your approval from some people. A job search is not the time to slack on your current job. Remember that your last day is just as important as your first, so make sure you leave with great recommendations. Feel free to share this article with your current supervisor as a way to start the conversation about assisting you in your job search process. This should be an exciting time for both of you. You’re moving on to bigger and better things, and they are helping you get there.